I have been working on getting a drop down list in Infopath to be populated with users of a Sharepoint Group. You can’t connect directly to the drop drop list, so you will need to create 2 data sources, 1 to the web service and another xml file with dummy data which will be replace be information from the web service. 1. 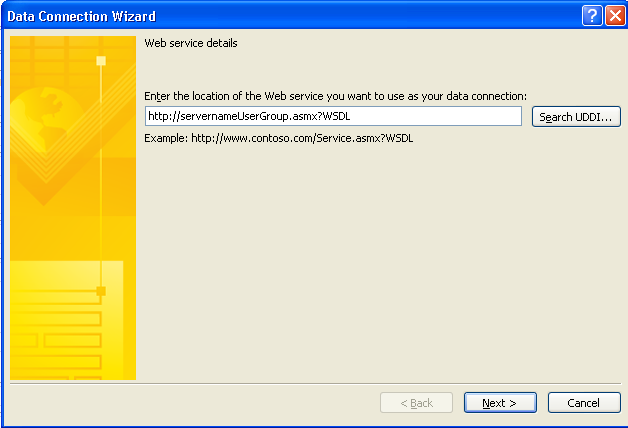 Create a data connection to the web service using the data connection wizard. 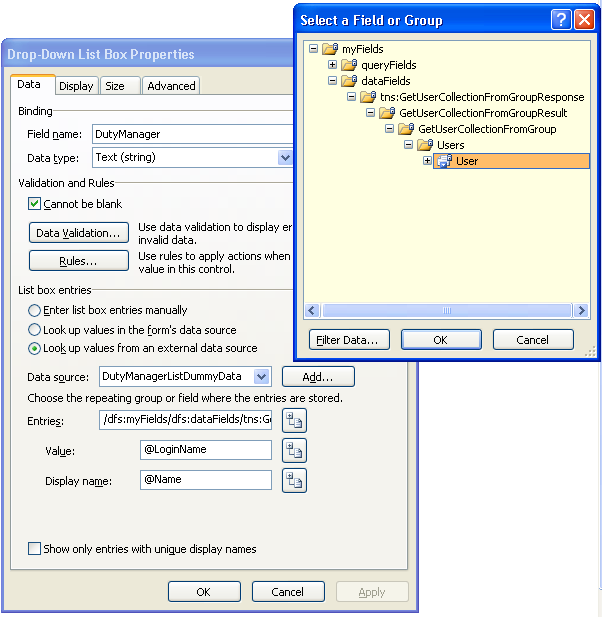 Enter Sample data, which is the name of the group which you wish to get data from. 2. You will need dummy data to be connected to the drop down list first. There are 2 dummy users in the xml, it tells infopath that it is repeating. Save the dummydata.xml and connect it via the Data Connection Wizard as well. It will open up Visual studio. Within the Loading Event, you will need the following piece of code. Run the preview and you should see the actual data instead of the dummy information. This entry was posted on March 25, 2008 at 10:32 pm	and is filed under Infopath. You can follow any responses to this entry through the RSS 2.0 feed. You can leave a response, or trackback from your own site. Handy post. I happened to find myself with a very similar problem last week. What I really need is a list of domain users in various AD groups. MOSS 2007 can clearly find this information itself but will it make it available as it does its own groups? Sharepoint will allow you to add domain/users from various AD groups into Sharepoint Groups. what if you have multiple domains? is there anyway to bring up all users from all domains? You should specify that this solution only works with InfoPath 2007. And you also need Microsoft Visual Studio Tools for Applications (VSTA). This is a useless solution for InfoPath 2003. And if you want to stay confined to script instead of code. but other than that, I really like this post, I will definitely use it if a client has the essentials needed to make this solution work. I have the same problem than Kevin, do you have an idea? Is there any way to pass groupname from the form control (value from text box) to populate user list? I haven’t done it before, but there is a reply on the msdn blog which seems to be what you are looking for. I am able to Send a user entered value in the “txtEmailID” text box to the webservice method dynamically & the webservice returns the value of the specific user whose email id is passed on. well.. it’s like I thought! I’m getting an “unspecified error” when trying to add the XML file as a data connection. Has anyone else encountered this and come up with a solution?